A survey of the West shows a variety of ways to gamble in every state but Utah. Environmentalists and sportsmen gather in Rock Springs, Wyo., to discuss the problems caused by increasing oil and gas development. 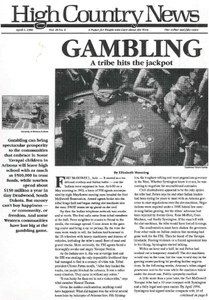 A Deadwood citizen who originally pushed for legalized gambling reflects sadly on the way her town has changed. The Grand Canyon Visibility Transport Commission gets ready to send the EPA its recommendation for restoring clean air to the Colorado Plateau. A symposium, "Managing Natural Resources at the Urban Interface: The Challenge of a Changing West," will be presented at Utah State University, April 17-19. The Symposium on Nonviolence and Civil Disobedience is being held at Whitman College in Walla Walla, Wash., April 19-21. Sen. Hatfield and sausages, hunting in a bra, East bunny "scramble" in N.M., Oliver Stone opposing buffalo hunting in N.M., Carlsbad Caverns a world heritage site, John Talbott fished without a license but still is on Wyoming payroll. Idaho honors Ernie Day, Nelle Tobias and Bruce Bowler; update on Dabo Lamine; Theo Colborn's book, "Our Stolen Future," Meg O'Shaughnessy leaves HCN; barcodes and reader survey. Self-taught grazing activist Michael Seidman wins a victory when a federal judge rules that the Forest Service's analysis of a grazing allotment on Arizona's Tonto National Forest was inadequate. Montana environmentalists rejoice at Bill Yellowtail's decision to run for the congressional seat vacated by Rep. Pat Williams. The Green Party will run a candidate against Republican Sen. Pete Domenici in New Mexico, and also wants to draft Ralph Nader as a presidential candidate. The Senate Energy Committee approves the temporary storage of nuclear waste near Nevada's Yucca Mountain. Yellowstone's new wolves knock the coyotes out of the "top dog" position in the park's ecosystem. The Klamath tribes of southern Oregon file a lawsuit to stop the salvage logging of traditional hunting and fishing grounds. High Country News offers High Country Snooze as an April Fool's look at the paper.